Being a blogger has opened up doors that I never imagined I would walk though. This was literally the case a few weeks ago. Christina (Cutestkidever) and I were personally invited to tour the new corporate Price Chopper building in Schenectady, NY. We had been told prior to going that only the people that worked there had seen many of the places were were being taken. No media had been given a tour at this point since they were just moved into the facilities. Talk about being honored. The world of Social Media and blogging truly made this tour possible. Had I not seen a Tweet on Twitter, gone to the Price Chopper page on Facebook and signed up for their Cook’s Ham event – this would not have happened. While at the Cook’s event at Price Chopper, Christina and I started to chat with Heidi and Liz about plans that we had for a local blogging conference. After the event, we continued to be in contact via Twitter/Facebook/e-mail/phone. While talking about the ideas we had for a blogging event in the area, I was asked if I we would consider something a little different. Of course, my answer was yes and I was told I would hear more soon. This is where a big thank you to Mr. Jerry Golub is in order. He is Price Chopper’s new President & COO and is very aware of the importance of Social Media. He asked Heidi to invite us for a personal tour of their new building. Of course, we said yes! This new corporate building is big news in the area. The new state of the art building has many green features to be energy efficient for the 700 Price Chopper employees that will work there. Even bigger was the initiative to transform what was once polluted brownfield into a usable corporate space. To read more about the building, The Business Review has more details about the new $30M corporate facility. 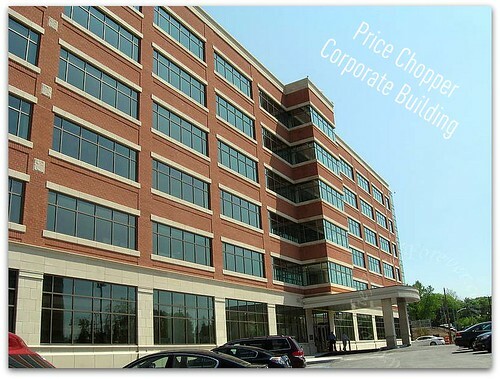 When you drive up to the Price Chopper building, you immediately notice the size of the building. Then you start to see the whole picture. The facility is gated and has amazing security. When I drove up, I was told where to park and proceed in to check into the building. When Christina arrived, we went into the building to the security desk. They found our names on the guest list and asked for our drivers licenses to make us guest badges. At this point, they called Heidi and Liz to let them know we were here. Once we were done giving security our information, Heidi, Liz and Maureen came to meet us in the lobby. I wish I had taken a photo of this area, but had not taken my camera out at this point. Not to worry, the photo taking permission came right after this and I started to take some photos. One of the stops on the tour is the giant conference area. Can you see where I am going with this? The ballroom like room is sectioned off into three smaller rooms that can be opened. The room has a lot of AV/technological opportunities for something like a blogging conference. 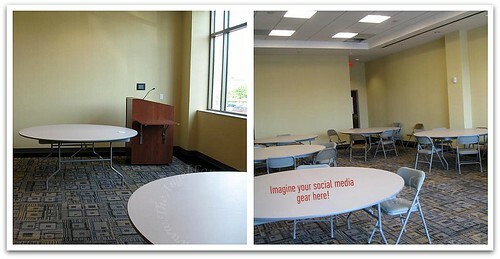 Round tables could be set up for networking and the ability to live blog/Tweet from any event thanks to Wifi availability. Christina and I kept imagining who would be up at the podium talking to all of the bloggers that come to our event. Yes, it was becoming more real with every step of the tour. Heidi, Liz and Maureen also took us to more behind the scenes areas. We saw smaller meeting rooms and back rooms that were not quite set up yet. One of the locations not completely set up was the new photography lab/kitchen area. When we walked into this room we were greeted with shrimp on a barbeque right in the area and the computer monitors set up to create the Price Chopper ads for the coming weeks. They explained that a kitchen would be there to help with preparations of their own displays. In addition to that, one side of the room would be used for the Kids Cooking Club segments with Jodie Fitz that are available online. I could definitely imagine break out sessions in here and/or a meet and greet time during a conference. Next, we were taken to the back of the cafeteria into a special room. The surprise was on us. We would be participating in a quality control/taste testing exercise. The following was set up on the table for each of us. 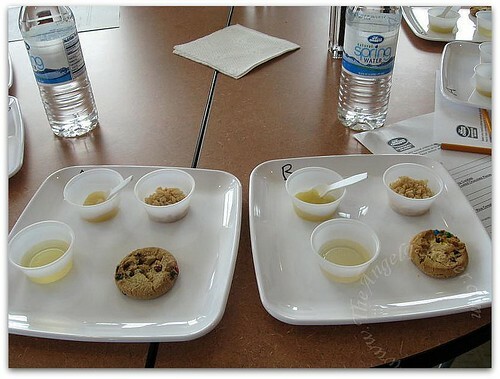 We were testing white grape juice, apple sauce, chocolate chip cookies and rice crisp cereal. Megan and Jane explained that they had done a similar exercise at a local middle school to show the students how often it is next to impossible to tell the difference between brand name and store products. Of course, they also showed the kids the math involved when the identities of the items marked A and B were revealed. Price Chopper uses this room, with a kitchen to keep quality control on their store items. They have different groups of people that do this to tell their input on taste, texture, look and feel compared to the brand name twin. It is not surprising that on almost all we were not able to tell much if any differences and several cases liked the Price Chopper brand item more. This was not only an educational/eye opening experience, but a lot of fun. Hmmm. . . something else for a conference perhaps?! Just as we were finishing up with this, Jerry Golub came to meet with us. I have to admit, I was even more impressed with his dedication to social media, his employees and the community in person. Mr. Golub explained why he feels Twitter, Facebook, and blogging are important to companies. In addition to this, he made me laugh by saying how funny it was to see me blog one day about ham and the next about shopping for Passover. After Mr. Golub left us, we brain stormed a little about the possibility of having our blogging conference at the Price Chopper corporate building. We had so many ideas in our head, but not enough time to fully develop them. We talked about a good time for one and what we would like to do. After this we went to lunch in the gorgeous cafeteria and chatted a bit more. So, what have we decided for our Capital District blogging conference? How: More details on pricing coming soon. Still need to talk to the caterer on the specifics for the day and will get back to you ASAP. Why: Why not?! There has never been a blogging conference in Upstate NY and we want to begin this tradition for those in the Northeast to have the opportunity. I would like to thank Price Chopper for making this conference a possibility. Thanks to you opening up your doors, our dream is now going to be a reality. We look forward to working with everyone over the next few months to finalize the details to share with bloggers who will be coming to the event this fall. If you have any questions please let us know. As soon as more details are available we will keep you posted and have a special sign up website up for purchasing tickets to the conference. Please save the date and we hope to see you in our area in October. 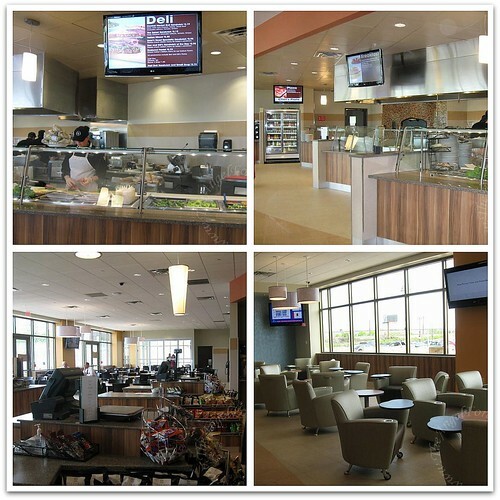 Disclosure: I was invited to the Price Chopper corporate building for a tour, lunch and to discuss using it for a conference facility. Much to my surprise we were given a taste test and some grocery items to take home to use with our families. No blog post was expected or compensation given. .-= killlashandra´s last blog ..No More =-. .-= Upstatemomof3´s last blog ..The Ongoing Church Dilemma =-. Perfect! I’m marking my calendar right now! .-= Albany Kid´s last blog ..A Visit To The Nature Center At Moreau Lake State Park =-.